Signature Converse rubber outsole. Classic canvas upper with white friendly colors. If the shoes don't match your outfit or you've just changed your mind now. Condition is Used. Very cool, rare woven converse. Used as per pics but still plenty of life in them. CONVERSE PINK GLITTER PUMPS BRAND NEW SIZE 6 UNWORE. Dispatched with Royal Mail 2nd Class. Good condition. Women’s Converse Hi Top Trainers Size 5.5. Condition is Used. Dispatched with Royal Mail 2nd Class. Animal Print CONVERSE pumps, Size 7. Black and white. 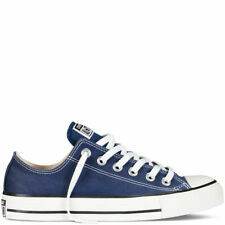 Converse is an iconic brand who design and produce casual shoes for everyday wear. Their classic design is a basketball shoe, which they have been creating since 1917. 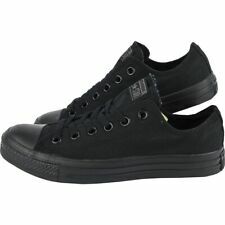 Nowadays, Converse is a popular footwear brand designed to be casual, stylish and comfortable. With a sporty feel, Converse shoes for women are designed for lifestyle and skate wear. With a rubber toe cap and thick rubber sole, Converse trainers are durable and protective. Usually, the uppers are made of canvas. However, some styles use leather and suede for a more fashionable and luxurious look. Typically, the trainers have a prominent laced front, although you can find trainers with a Velcro fastening for ease. Converse trainers are recognisable with their label on the tongue, as well as the back of the shoe on both the tag and rubber sole. Similar to the canvas trainers, Chuck Taylor All Stars are Converse's most popular and widely recognisable pair of shoes. Designed as basketball shoes, these high top trainers lace up to the ankle, giving you increased support. 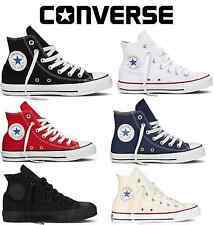 Chuck Taylor All Stars come in a range of colours and make a great casual and comfortable, lightweight boot. For iconic style, Converse knee-high boots feature the standard Converse detailing. Complete with a rubber sole and toe cap, these knee-high boots have laces going all the way up the leg and come in a range of colours. Their knee-high boots are casual and lightweight and can make a sporty alternative to a traditional leather boot. For a cute and casual look, Converse also offer ballerina canvas shoes, which are a slip-on style without laces but still have the famous striped rubber sole. Converse Ballerinas are an excellent solution to quickly slip on and maintaining the typical Converse style.